A man has died after a serious house fire in Moray last month which left two others injured. 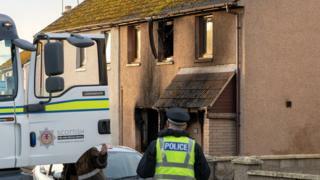 The 35-year-old - named locally as Neil Thompson - was taken to hospital along with a 31-year-old woman and a 13-month-old girl after the fire in Lossiemouth on 21 February. Police Scotland confirmed he had died from his injuries. Det Insp Norman Stevenson said: "My thoughts are with everyone affected by this tragic incident." There were no apparent suspicious circumstances. Six fire engines and a height reach vehicle were joined by support units in tackling the fire in the town's MacDonald Drive. The 13-month-old was airlifted to hospital for treatment.